Product code: VA278B Categories: Foot Stools/Steps, Home Living, Other Accessories. 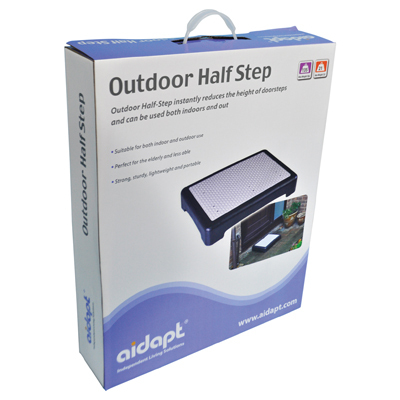 The Aidapt Outdoor Half Step is a perfect aid for the elderly or people with limited mobility around the home. 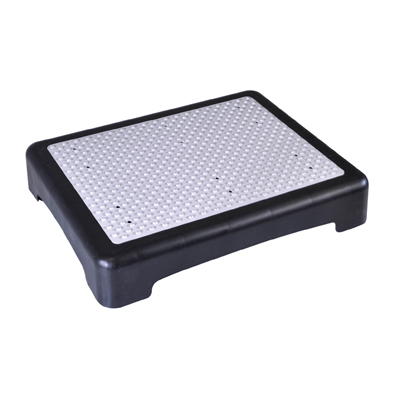 If you find it difficult to lift your feet and remain steady as you step up to your doorway, this is the product for you.The Aidapt Outdoor Half Step can help. It cuts the rise in half so you can climb more easily. It features an extra large platform that lets you balance and get your footing before moving on. Great for indoor stairs too! It has a durable, heavy duty plastic surface with sure grip dimples for added security. The weather resistant rubber mat ensures better traction and drainage holes prevent the step from pooling water. The large surface area of the half step also means there’s ample room to fully stand on the platform and regain your balance before stepping again. The step is made from high quality durable plastic and is fully waterproof and suitable to be kept outdoors in all seasons. Instantly reduces the height of doorsteps. Perfect for the elderly and less able. Strong, sturdy, lightweight and portable.